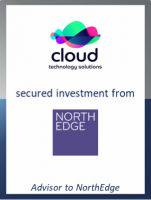 GCA Altium acted as exclusive financial advisor to NorthEdge Capital on its investment in cloud transformation and infrastructure specialist Cloud Technology Solutions ("CTS"). The deal represents GCA's 44th transaction in the Technology sector since the start of 2017, firmly positioning the business as one of the leading tech-focused investment banks. Based in Manchester, CTS provides cloud transformation services and software products to a broad range of businesses and is recognised as a Google Premier Partner. Its proprietary software has migrated over seven million users to the cloud. Established in 2008, CTS' turnover has tripled over the last three years and the business now employs over 100 staff across its offices in Manchester, Belfast and Edinburgh. NorthEdge's investment will provide support for the business to continue the development of its own software products as well as development capital to accelerate growth through complementary acquisitions in machine learning, artificial intelligence and data analytics. The transaction sees NorthEdge back the existing management team led by CEO James Doggart, CSO Steve Dobson and CFO Hannah Liptrott.